The Centre for Policy Alternatives has prepared this short guide to answer some further questions that have arisen in the public debate about the constitutional crisis in Sri Lanka. See the previous set of Questions and Answers here. What was the Supreme Court’s decision on November 13th? When the President issued a gazette on November 9th containing a Proclamation dissolving Parliament and calling for a General Election, a number of parties made fundamental rights petitions to the Supreme Court challenging the constitutionality of that decision. On November 13, the Supreme Court issued something called a Stay Order on that gazette. The Stay Order suspends the effect of the gazette until December 7th. The Supreme Court also issued an Interim Order to the Election Commission to prevent it from making any election preparations, also until December 7. Finally, the Supreme Court granted leave to proceed to all the petitioners. This means that they can now make their arguments before the Court. What will happen next with the case? The petitioners will now get to argue their case before the Supreme Court on December 4th, 5th and 6th. The respondents in the case, which include the Attorney General appearing for the President and the Election Commission, will also get to make submissions. After this, the Court will make its Determination on whether or not the President’s gazette is constitutional or not. 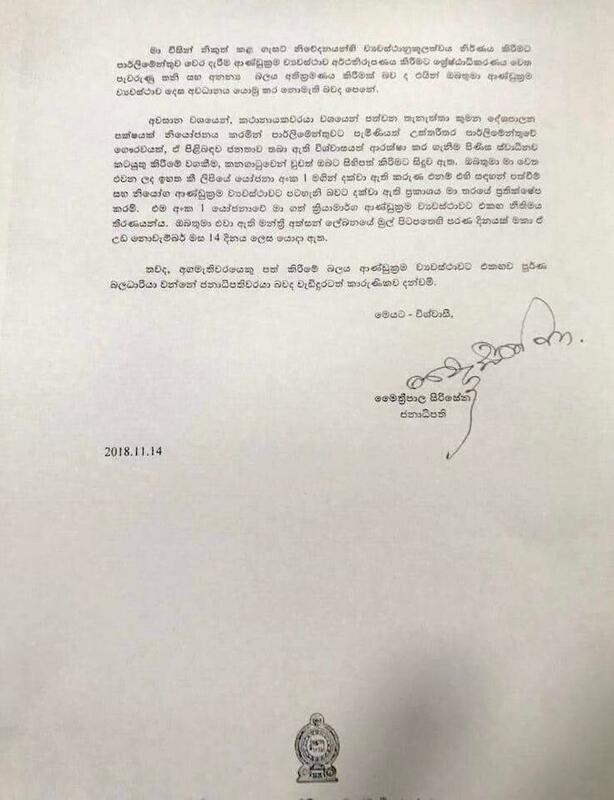 It must do so within two months, however, since the last date for argument is followed immediately by the expiry of the Stay Order on the gazette and the Interim Order to the Election Commission (December 6th and 7th), it is likely the Court’s Determination will come immediately thereafter. If the Court decides the President’s gazette notification is unconstitutional, then Parliament remains undissolved and the election cannot happen. If the Court decides it is constitutional, then Parliament is dissolved and the election can go ahead. A new date for the election will have to be fixed given its suspension due to the case. Which gazettes issued by the President are now operational? What are the Standing Orders of Parliament? The Standing Orders of Parliament prescribe the rules for Parliament and its MPs to function in an orderly manner. Article 74 of the Constitution empowers Parliament to adopt Standing Orders to regulate itself. They contain rules for matters such as the election of various positions in Parliament, voting procedures, rules of debate, guidelines for the business of the various Parliamentary committees and procedures for impeaching or removing various officials. The Standing Orders are adopted at the start of each newly elected Parliament or whenever the Committee on Standing Orders prepares a new revision. The current Standing Orders were adopted by Parliament and came into effect on April 15th, 2018. The Speaker, through the assistance of the Secretary-General of Parliament, gives assistance to MPs on the correct interpretation and application of the Standing Orders. What does a suspension of Standing Orders in Parliament mean? Standing Order No. 135 provides that the Standing Orders can be suspended anytime through a motion made by any MP and a majority of MPs voting for it. Standing Orders are suspended to enable any special business to be considered. the Secretary General of Parliament asking each MP separately how they wish to vote and recording those votes. What is a no confidence motion? A no confidence motion is a motion in Parliament against a Government. If the no confidence motion passes by a majority of MPs voting for it, then that means the Government no longer has the support or “confidence” of the Parliament. Our constitution does not explicitly provide for a no confidence motion against the Prime Minister, but it does against the Government as a whole under Article 48(2) of the Constitution. Any MP can bring a no-confidence motion against the Cabinet of Ministers. If a no confidence motion is successful, the Cabinet of Ministers is dissolved, and unless the President has dissolved Parliament as well, he may appoint a new Prime Minister and Cabinet of Ministers under Article 48(2) of the Constitution. This means the President can appoint a new Prime Minister who is in his opinion most likely to command the confidence of Parliament under Article 42(4). How is a no confidence motion voted on? Neither the Constitution nor the Standing Orders provide instructions on how a no confidence motion can be voted on. However, a no confidence motion would generally be considered a special business of Parliament, therefore first the Standing Orders would need to be suspended (see question 5 above) and then the no confidence motion made. Article 72(1) of the Constitution provides a general instruction on voting saying that any question proposed in Parliament can be decided by a majority of all MPs present and voting. How the vote is conducted is up to the Speaker under Standing Order No. 47. It may be taken by voice; or by division if any MP requests it, which means through a count of MPs rising for or against the motion; through electronic voting; or by asking each MP individually (see question 5 above). What happened in Parliament on November 14? As reported by multiple media reports and as per the statement released by the Speaker’s office, TNA MP Hon. M.A Sumanthiran moved for a motion to suspend Standing Orders. Thereafter, the Standing Orders were suspended after a majority of MPs voted in favour of the suspension. Then JVP MP Hon. Anura Kumara Dissanayake moved a no confidence motion against the Government. This was then seconded by JVP MP Hon. Vijitha Herath. It was further proposed that the no-confidence motion should be taken up on the day itself (14th November 2018). Accordingly, after a majority of MPs voted in favour of the no confidence motion it was announced by the Speaker that the no confidence motion was passed with a majority. 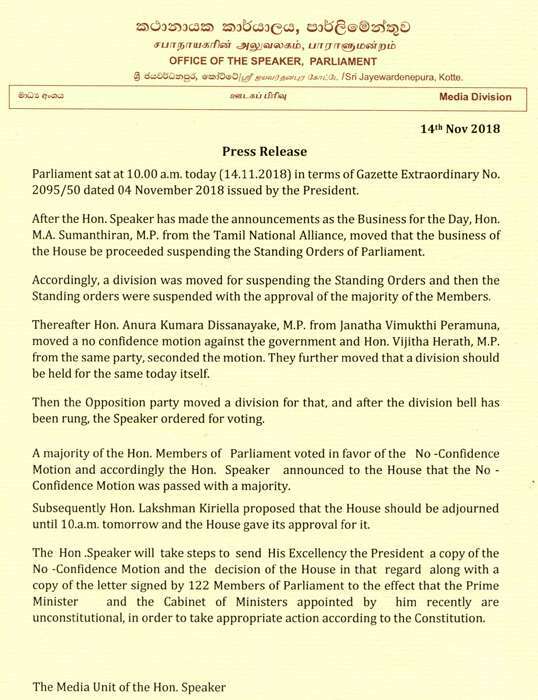 Lakshman Kiriella then proposed for the Parliament to be adjourned (as stated in Standing Order No 15) until 10.00 a.m. on November 15th with the approval of the Parliament. What is the effect of what happened in Parliament today? 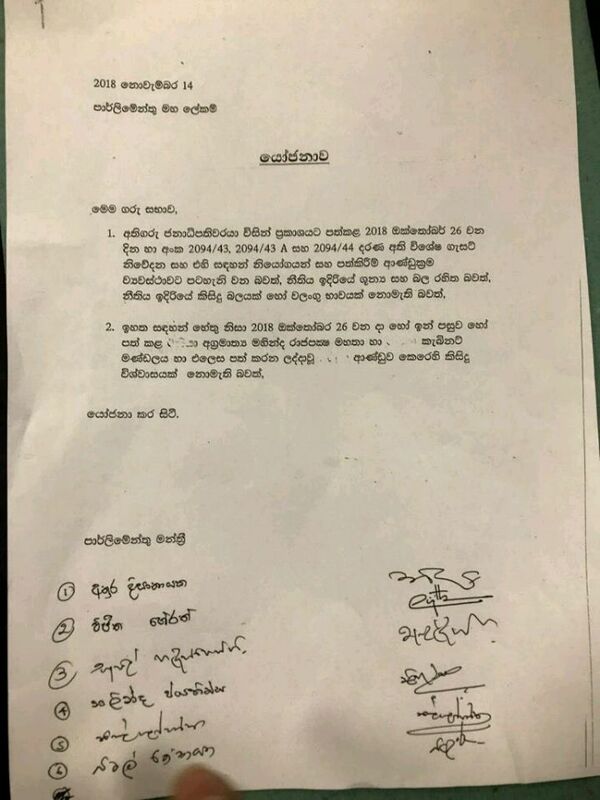 Since a no confidence motion was carried out successfully, the Cabinet of Ministers headed by Prime Minister Mahinda Rajapaksa can now be considered to be dissolved under Article 48(2) of the Constitution. 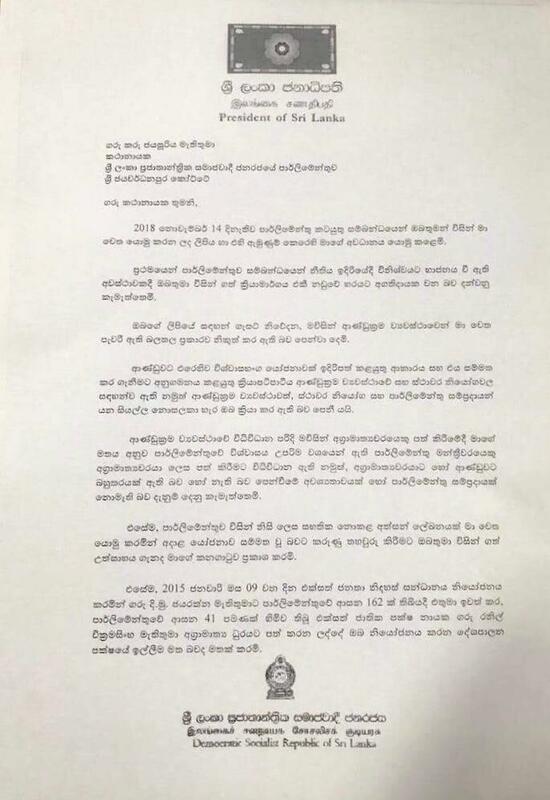 The Speaker announced that he will forward the no confidence motion, Parliament’s decision on the motion as well a copy of the letter signed by 122 MPs to the effect that the Prime Minister and the Cabinet of Ministers appointed by the President recently are unconstitutional, to the President to “take appropriate action according to the Constitution”. The President is able therefore appoint a Prime Minister and Cabinet of Ministers under Article 48(2) of the Constitution who is in his opinion most likely to command the confidence of Parliament under Article 42(4). The President, however, has responded to the Speaker on November 14 itself stating that the Speaker has ignored the Constitution, the Standing Orders and Parliamentary conventions with his actions on the day. The President cites that there is no Parliamentary convention requiring a Prime Minister or a Government to show a majority. He also rejects the letter signed by 122 MPs due to it not being appropriately certified by Parliament.